To get a good pump, I tend to do 8-12 reps then add in a few half reps at the end of each set. After 3 supersets of arms I came back to Shoulders and did a few sets of Cable Raises for the medial delts then finished off with Calf Raises, Back Extensions, Abs and Forearms. No cardio today but I'll make up for it tomorrow. I weighed in a few pounds lighter than last week so the Intermittent Fasting seems to be working with no ill effects on my training. At home cooling off I read up on Vince Gironda's Facebook kept up by former student Robert Torres. He does a great job of posting inspirational and educational stuff about Vince along with pupils and contemporaries like Frank Zane and Larry Scott. 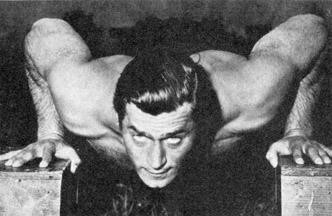 There was a great video of actor Clint Walker's home gym from the 60's which has all these great, space saving features that utilizes benches and poles to make for flat and incline as well as dips and a preacher bench. It's interesting to see something like this as the principles from back then still apply today that it's not about being a bodybuilder but simply working out to feel good, fitting it in whenever possible, eating quality food to recover, sleeping enough to recuperate and making sure you get your chins in!